The Dauntless first entered service in mid-1939 and distinguished itself in the Battle of Midway against Japanese carriers Akagi, Kaga, Soryu and Hiryu. 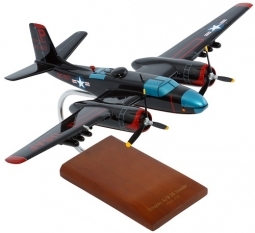 Its capacity to absorb battle damage made it a rugged adversary and is one of aviation history's classic warplanes. 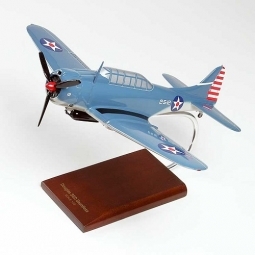 Designed as light bomber and reconnaissance aircraft, Dauntless SBD (Scout Bomber Douglas) monoplanes served during WWII with US Marine Corps, Army and Navy air squadrons. 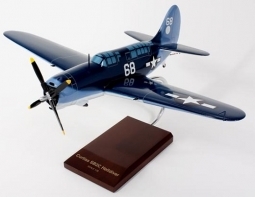 The Dauntless originated with the design of the Northrop BT-1 of which the Northrop Corporation was a subsidiary of The Douglas Aircraft Corporation. 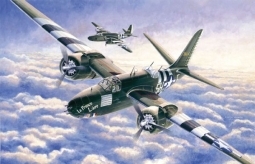 Armament consisted of two forward firing 0.50 in machine guns (mg) in the engine nose cowling and one flexible rearward firing, drum-fed 0.30 mg. A swinging bomb cradle carried a 1,000 lb bomb below the fuselage and a 100 lb bomb was mounted under each wing. 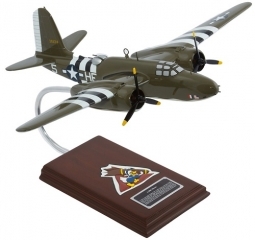 The bomb cradle was designed so that the bomb would swing clear of the prop during dive-bombing maneuvers. 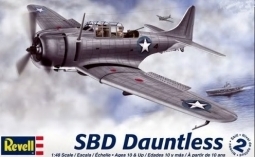 Douglas SBD Dauntless "Schwab's Wagon"